The Phuket Phi Phi timetable gives all you need to know about the times of the ferries from Phuket town to Phi Phi Don Village pier. The morning ferries leaves at 8.30am and the afternoon ferries leave at 13.30 and 14.30 from Rasada pier on the Phuket port just outside the main town. The Phuket Phi Phi timetable also tells you the crossing times which vary a little depending on the ferries and the route they take but take between 1 hour 30 minutes to 2 hours. On the 08.30 ferries from Rasada Pier you have a lot of choice between ferry companies as there are many that do the one day tour from Phuket to Phi Phi and back to Phuket at night. The Phuket Phi Phi timetable bus also gives the beaches and locations that include free minibus pickups. When you book the Phuket Phi Phi ferry all you need to do is explain which hotel you are staying at and the minibus will pick you up at your hotel reception. This free ride is in a 12-15 seater minibus unless you are a large group in which case it can be a 40 seater bus. Check the link above to see if your beach and hotel / resort has a free pick. It can be quite confusing but the Phuket Phi Phi timetable for ferries appears to be the same as the timetable for the Phuket Phi Phi Tours. These are the same boats except for the Chao Koh boat which is an out and out ferry with no tour program. Most of the tour cruise boats sell ferry tickets Phuket to Phi Phi as part of their program however as these boats are the largest ferries they are the most comfortable. Tour boats might add a trip around Phi Phi Ley before arriving at the Phi Phi Pier which can add 30 minutes to the ferry crossing. The large Sea Angel Cruise takes 1 hour 20 minutes to cross between Phuket and Phi Phi but often goes round the southern end of Phi Phi Ley spying Maya Bay Loh Samah and the Viking Cave and adding time to the journey to the pier. 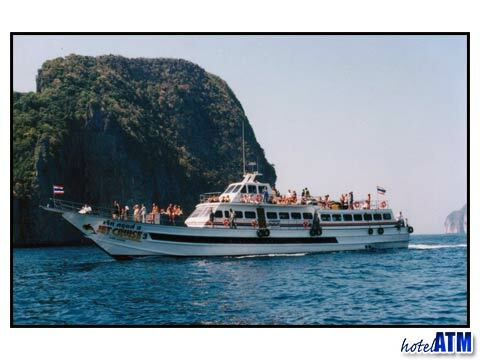 It is important to read the Phuket Phi Phi timetable right if you are coming down from Phuket international Airport and want to make the afternoon ferries for Phi Phi. If you arrive at the airport after 12.30 you might not make the 14.30 ferry so you might need to take a Phuket hotel near the ferry or perhaps a private but more flexible speedboat transfer to Phi Phi. On the other hand you might want to stay one night in a nice Phuket beachfront resort and check out this famous destination. The Phuket Phi Phi weather doesn’t effect the timetable and ferries run all year but June and September can be more windy so larger ferries or cruise boats are recommended in these months. 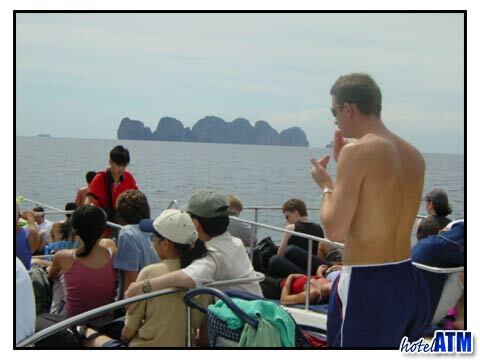 There are no timetables for the Phuket Phi Phi speedboat transfers as they are private crossing and can go any time during the daylight hours. The speedboat crossing usually takes 45 minutes and leaves from the Boat Lagoon or Royal Phuket Marina.